The score says a lot. It just wasn’t the Penguins’ game Wednesday night from puck drop to their furious third period comeback. This game featured the same Penguins team I’ve come to see a lot this year: an inconsistent one. 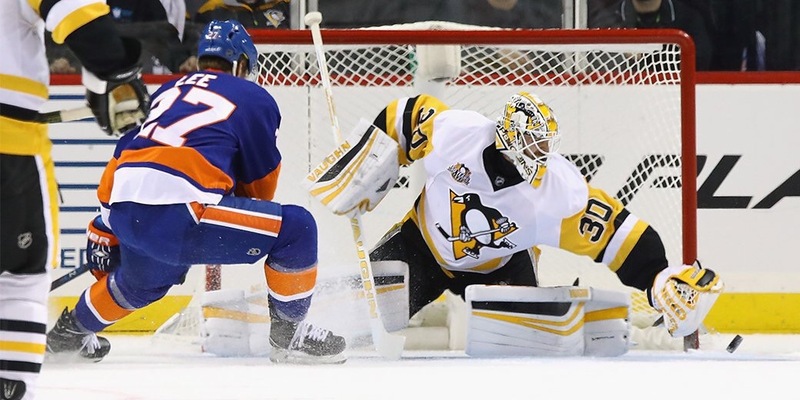 After a late first period goal by the Islanders and two more in possibly the worst second period this team has played this year, the Penguins capatlized on Thomas Greiss’ third period struggles and tied the game at three. With 26 seconds left, Anders Lee tipped a shot home standing right infront of Matt Murray for the game winning goal. Nikolai Kulemin added the empty net dagger. Matt Murray was a bit off. He made the incredible save on John Tavares and a couple other scrambling saves but let in soft goals including the third goal. It wasn’t his fault that Justin Schultz kicked it towards Murray who unconsciously knocked it in…but Murray gave up a soft rebound, albeit something he hasn’t done much. Murray was as up and down as this Penguins team was. Sidney Crosby is the most dominant player in the NHL right now and it’s not even close. His play to drive the tying Evgeni Malkin goal was something that not many can do. It was an effort and skill defensive play from his knees and he somehow found defenseman Brian Dumoulin who gave it to Geno for the goal. There is no one that I’d take over Sid right now. He’s not even the highest paid player in the NHL currently. Poor John Tavares. This man is a top five NHL talent playing on a horrible team. You could see it in his body language that he’s frustrated. At times, he’s called himself out even though he’s got 17 points in 22 games. What is the captain supposed to do? Pin blame on the rest of his teammates? No, he’ll say the right things about himself needing to “step up” to an even more elite level. Tavares is going to find himself a nice free agent contract waiting for him in two years.